Facebook co-founder and CEO Mark Zuckerberg understandably has social media accounts on other networks. And like most avid online users, he ignored to maintain standard security password practices. Over the weekend, Zuckerberg’s Twitter and Pinterest accounts were hacked. The group responsible, OurMine Team, also claimed to have gained access to his zuck Instagram account. ‘OurMine Team’ claims the hacks were possible because of the LinkedIn dump last month, which carried leaked details of 167 million accounts. 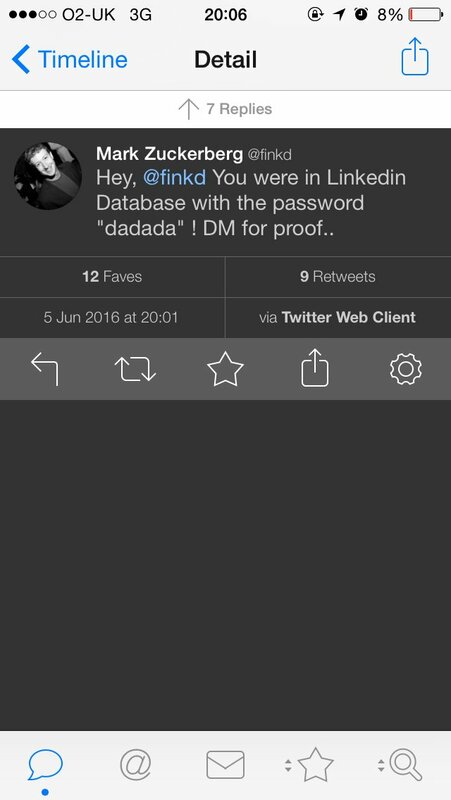 At that time, LinkedIn had advised users that passwords be changed immediately. VB says Zuckerberg may have used the same password for his other social media accounts, which made the hack possible. This is another reminder that if you have a LinkedIn account, you should probably go ahead and change your password there, and everywhere else for that matter. In fact, you should make it a habit to regularly change your passwords on all your online accounts. And if that is too much of a pain, at the very least, make a habit of using different passwords.